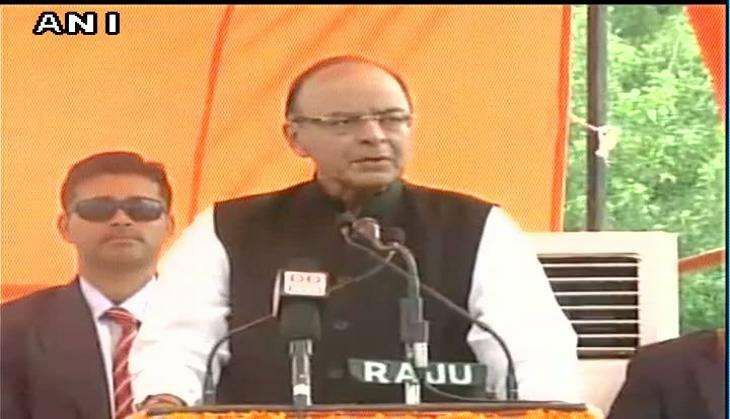 Union Finance Minister Arun Jaitley has lashed out at Pakistan for the unrest in Jammu and Kashmir. While speaking at the Bhartiya Janta Party's Tiranga Yatra in Jammu on 21 August, Jaitley said: "Pakistan doesn't consider Jammu and Kashmir as an integral part of India. In 1990, when they realised that they can't win in wars, they started infiltrating terrorists into the state of Jammu and Kashmir". "A new serious situation has arisen. Pakistan and various other forces are involved in it, and the country's unity has been challenged once again," he said. Speaking on the issue of the raising of Azadi slogans at an event conducted by Amnesty International in Bengaluru, the finance minister said: "Four days ago, 'azadi' slogans were raised during a program in Bangalore (Amnesty India), Yesterday I heard Karnataka Home Minister's statement stating that he feels whatever happened there wasn't wrong." He also lashed out at the Congress for trying to take political advantage of the Amnesty International row. "There are a few political parties even today, who exploit such issues for vote bank politics," he said. Co-relating the incident with the issue where 'anti-national' slogans were raised at Jawaharlal Nehru University, he said: "When anti-national slogans were raised in JNU, we were the only party who opposed it, in and outside Parliament. Whereas many of the political parties supported them, in fact Congress Vice-President went to JNU to support them."